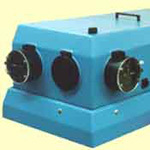 McPherson, Inc. Research Grade Czerny-Turner Monochromators are available in many different focal lengths and with many different options. Chances are good that we have one just right for your application. Models ranging from 0.67-m to 2-meter focal lengths share a wealth of features. 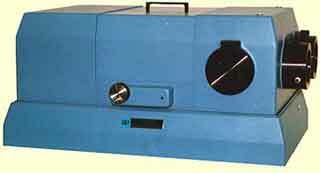 The Model 207 offers the user the most throughput and fastest aperture in a long focal length instrument. 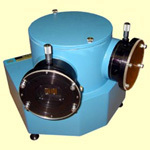 This is ideal for photoluminescence and Raman applications. We also make the Model 207, and all the long focal length Czerny-Turner models, in vacuum compatible versions. PDF data for the Model 207 Vacuum (207V) is available here. General information for the long focal length vacuum Czerny-Turner models is here. 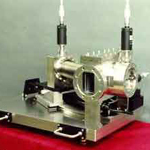 Used in air the spectral range of these instruments extends from 185-nm to 78-µm, and with vacuum down to 105-nm (depends on the grating.) For intermediate ranges a purge gas can be used (Nitrogen, for example.) McPherson SNAP IN gratings allow the alignment-free use of many different gratings. Easily view a wider spectral range or obtain higher resolution! You can retrofit years later and not have to worry about alignment with the McPherson SNAP IN approach. Our dual grating turret also accepts these easy to exchange gratings. McPherson optics are Aluminum coated with a top layer of Magnesium Fluoride. This coating provides extremely good response in a broad spectral range. If required by your application other coatings (Gold, Silver, Aluminum, etc.) can be provided. Well equipped, these instruments feature: multiple entrance and exit ports, high precision wavelength drives, extended range operation, Echelle, and oversize grating mounting capabilities. Optional features include grating turrets, imaging optics, multi-source, and multi-detector turrets further increasing versatility. See the features sheet to learn more.